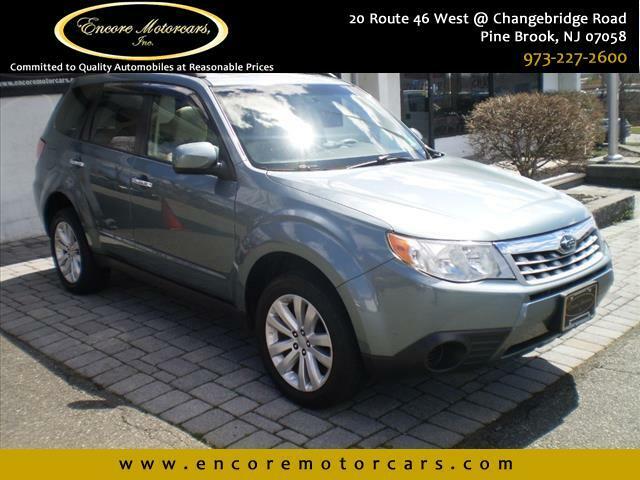 Used 2012 Subaru Forester 2.5X Premium for Sale in Pine Brook NJ 07058 Encore Motorcars Inc.
Clean Autocheck! One Owner! GREAT CONDITION!This is an excellent price for a 2012 Subaru Forester X Premium AWD with only 62k miles, 2.5L H4 engine, and an automatic transmission. This Forester X Premium is in great condition with alloy wheels, rain guards, and a luggage rack. The interior is loaded with features such as phone connect-ability with voice controls, cruise control, power windows/doors/mirrors/seat, huge sunroof, side airbags, radio with AM/FM/CD/SAT, and much more. You can tell this vehicle was well maintained and has NEVER been in an accident. Please call 973.227.2600 for more detailed information and to schedule an appointment to come see and test drive this clean 2012 Subaru Forester X Premium AWD before it is sold! CALL 973.227.2600 right now. If you want to bring it to a local mechanic of your choice, no problem.